I recently read a story on LEDs magazine about Toronto’s Palace Pier condominium tower becoming the largest residential LED conversion in North America. The Palace Pier is an upscale, 44 floor condo building with spectacular views that the designers wanted to carry over into the interior of the building. They replaced the existing 1300 MR16 halogens with direct MR16 replacement LED modules. The halogens consumed 35 watts of electricity versus 4 watts for the LED replacements. Kudos on being green! The thing that I found most interesting here is that the contracted company providing the replacement LED fixtures does not put up complete specifications for either of their replacement LED products: no datasheets, nothing specific. Just a general 300+ lumens for their MR126 replacement product. I question the comparison in brightness between MR16 halogens and the LED replacements. The story just says comparable brightness but when you go to the CRS website, all you see is the 300+ lumens. Ignoring the fact that lumens is not brightness but total light output in all directions as measured in an integrating sphere, 300 lumens isn’t even close to the 1000+ lumens light output you get from a typical 35 watt, 12 VDC MR16 halogen lamp. What I am sure they are referring to is center beam candela, which is a brightness measurement but their website doesn’t have that specification. Perhaps the MR16 halogens they are replacing weren’t particularly bright, a very real possibility but who knows? I’m sure the fixtures were tested, at least by their own eyes, to make sure they were as bright or brighter but the published specs alone don’t bare that out. I am also sure that in this case it is just an oversight but it does lead me to ramble on about something that is all too common in the industry these days: confusing. missing, or misleading specifications. Unfortunately, beam candela measurements have to take into account the measurement distance and the angle at which the beam is sampled, neither of which needs to be defined in the results. So a manufacturer that took a measurement at 4 feet away from the lamp over a 26 degree sampling angle and only came up with 480 Candela could retake the measurement at 3 feet from the lamp for a 10 degree sampling angle and get a more favorable 950 Candela and publish that as their spec without saying it was measured at 4 feet at a sample angle of 10 degrees. If these were separate manufacturers and separate lamps, how could you make a direct comparison based on 480 candela versus 950 candela without knowing the missing information? You couldn’t, really. Beam candela refers to how bright a narrow beam of light will look to an average human observer at some specific distance away. A lamp such as the replacement lamps used at the Palace, may only output 300 lumens but at a very narrow 15 degree beam angle so the brightness at, lets say 4 feet away may be quite high compared to an MR16 halogen at the same 4 feet with a more impressive 1000 lumen output but with a broader beam angle of 30 degrees. Kind of confusing isn’t it? One lamp manufacturer may publish their 1000+ lumens as a measure oft their lamps brightness while another may publish 850 Candela as theirs. So which one is brighter? You’d have no clue without actually buying each and testing them both. Errr! As an LED manufacturer and distributer, I have a real problem with LED lamp manufacturers that do not put up their specifications and when they do, they only put up generalities or use the more confusing numbers such as lumens as an indicator of brightness. This leads to confusion and hurts the industry as a whole. I know of several large companies/institutions that would switch over to LED lighting if the market weren’t full of confusing and misleading numbers. They just won’t take the chance. The DOE, working on standardized testing methods for LED based architectural lighting, has run into this big time with submissions that had stated outputs no where near what the DOE’s testing bore out. Click here to read more about the DOE’s efforts on standardized testing methods for solid-state lighting. This entry was posted in architectural lighting, Innovative Lighting Design, Solid-State Architectural Lighting and tagged architectural led lighting, architectural lighting, architectural lighting design, architectural lighting design tools, Architectural Lighting Industry, architectural lighting specifications, commercial product testing, daylight planner, daylight planning, department of energy, designing with light, doe, energy efficient, energy savings, energy star, energystar, led architectural lighting, led cities, led city, led news, led residential light, led specifications, led technology, led-based residential lighting, leds, leds in the news, lighting calculation, lighting design, lighting designers, lighting engineering, lighting industry market, lighting industry news, lighting market, lighting specifications, product testing, residential leds, residential light design, residential lighting, residential lighting projects, residential street light, saving energy, Solid-State Architectural Lighting, solid-state lighting, solid-state lighting product testing, ssl product testing, standards and procedures, us department of energy, us doe. Bookmark the permalink. While I certainly share your concerns about standardized testing I would like to respond to a few points you mentioned in your article. First and foremost, the reason you did not find the detailed information you are looking for on our website is because we are still creating the datasheets. The Palace Pier project was under a strict timeline and the media launch was earlier than we were able to publish our detailed datasheets. I assure you they will be posted to our website in the near future. There you will see an average lumen output for a 50W halogen to be around 625 lumens, or 12.5 lumens / watt. A 35W is around 440 lumens, which is higher than our published 300 lumen specification, but not by enough to make a significant difference for many applications. In addition, our initial testing is demonstrating CBCP figures well in excess of 1,000 cd and the beamspread is quite. An example of a 35W GE halogen MR16 with a wide beamspread can be found here http://genet.gelighting.com/LightProducts/Dispatcher?REQUEST=COMMERCIALSPECPAGE&PRODUCTCODE=20859&BreadCrumbValues=CATG,_Lamps_Halogen_MR_MR16&SearchFieldCode=null -and indicates a CBCP figure of 900 cd. Obviously there are other models with higher CBCP figures, but they are also much narrower beam angles. Admittedly there are many shortcomings in the industry. 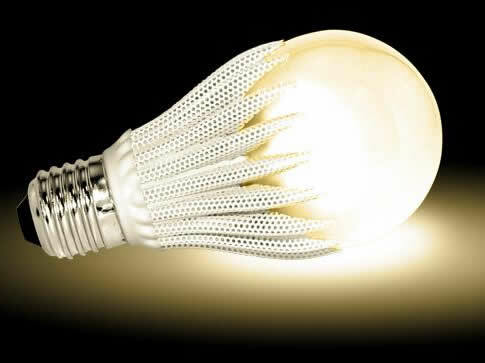 However, there are manufacturers such as CRS Electronics leading the charge on high quality LED lighting products. As we move to full production on this light, architects and lighting specifiers will have IES files and datasheets made available. Thank you for cautioning your readers on the inconsistencies of test data and testing procedures. The CRS Electronics LED MR16 as well as the future release of our flourescent tube replacement will be tested according to, and in compliance with the new Energy Star solid state lighting criteria. That’s a fair point: That the project far outpaced the data. Perhaps the story could have been put on the QT just long enough to give your company time for your web data to catchup. It wasn’t my intention to cast CRS Electronics in an unfair light and if I have, then I apologize. Regarding the numbers. I have found several 35 watt MR16’s with “stated” ratings over 1000 lumens. Of course, I’m relying on other manufacturers to state the figures accurately. Some of those lamps are newer dichroic reflector models that were perhaps not included in the LRC testing? Regarding beam candela, thats exactly my point Scott, there are plenty of 35 watt MR16’s that produce much higher beam candela measurements but the viewing angle need not be defined and it often isn’t because it’s generally so narrow as to be next to useless. So they publish their lumens output figure instead. Thats when guys like you and me get call from people asking how our lamps, rated in CBCP stack up against brand-X’s lamp rated in lumens. Errr! Thanks for taking the time out of what I can only assume is a very busy schedule to respond. Congratulations on the success of the project, good luck moving forward! Today is May 24 which is some 4 months after the January 15 post from the President of CRS Electronics. I went to their website today and they still don’t have any specifications, as Craig noted in his posting. To say that they don’t have them yet because they are still creating the data sheet doesn’t hold anymore. This just further makes the point about the lack of information from LED fixture manufacturers. How about some truth out there please? You’re hurting the industry for all of us. I agree completely that we need to regularise the rating system for led’s. I know of many companies out there selling very inferior products and claiming they replace 50w dichroic lamps. However there are manufacturers and I think CRS may be one of them, who have produced a lamp that simply beggars belief. To produce 300 lumens from an MR16 retrofit is quite incredible if you consider the restrictions on heat dissipation. It is also agreed that on paper 300l is less than 420l (obviously) but a dichrioc lamp sheds light all over the place (even behind the fitting itself if it is recessed) so how much of the light actually goes where it is supposed to? The whole idea of a spotlight is to illuminate a spot! In most applications you don’t need all the light that a dichroic lamp produces, in fact you could replace a 50w lamp with a CRS or equivalent LED and most people would not have a problem with it. Like all these things the proof of the pudding is in the eating and that is why in 99% of cases my customers want a trial. If they dont like it they don’t buy it, simple as that. I very much agree with the proof being a demonstration, I regularly show a variety of not only LED MR16’s but also Halogen MR16’s so that people can see that the rule of thumb for a halogen can differ from manufacture to manufacture. What I find amazing is that while people question LED data all the time (which I agree with, there is allot of rubbish on the street right now) they don’t question the halogen or fluorescent data. Is it lab data or delivered data, what is the fixture efficiency? Very few manufacturers actually publish the efficiency of the fixture, I have seen some MR16 down-lights that have baffles that interrupt the optics and I would be very surprised if the efficiency was any more than 60. Yet the manufacturer will say that you should use bare lamp data in for photometric calculations. LED’s aren’t right for every application, granted but I do think they get a rough ride of it. I have even put a CRS lamp next to 3 different price point 35w MR16’s and even though the CRS is getting more delivered lumens and perceived brightness people still look at the data and tell me it cant happen.